﻿ Emerging Market bear market coming to an end? Emerging Market bear market coming to an end? Emerging Market (EM) equities have been having a torrid time in 2018. The MSCI EM index is down -19% in US dollars from its January 2018 highs. There are several likely reasons for the problems but one factor that has historically had a big influence is no longer a negative. That factor is the US dollar. As the chart below shows, the relative performance of EM equities and the change in the US dollar (BBDXY Index on Bloomberg) tend to be closely related. The dollar is shown inverted so the declining line indicates a stronger dollar. The rally in emerging markets that began in February 2016 coincided with a period of dollar weakness. The dollar and EM relative then moved broadly together until May 2018. 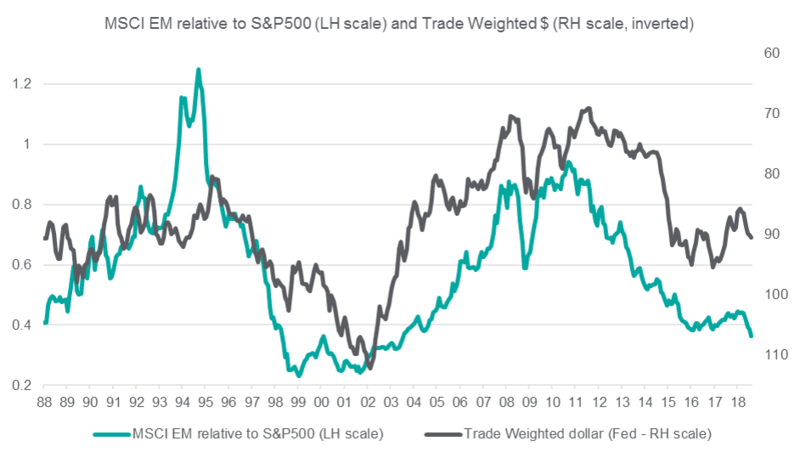 The trade weighted dollar is at the same level today as at the end of May 2018, but EM has continued to underperform. We suspect this is at least in part because of the uncertainty around the impact of US tariffs on Chinese imports, as well as the gloomy headlines from Turkey, Argentina and Brazil. But if we think the relationship between the dollar and EM will reassert itself then EM looks like it has either gone too far down OR the dollar is going to appreciate significantly from here. Our money would be on the former suggesting EM is a buy. The longer term relationship is shown below, monthly back to 1988. Here we have used the Fed’s trade weighted dollar series as the Bloomberg BBDXY index only goes back to 2004. The relationship is not perfect but the broad trends of appreciating dollar generally bad for EM and weakening dollar good for EM are evident. There have been periods when it breaks down. 1992 -1994 for example was not really about the dollar. That was the first discovery of China (first NYSE listed China funds were launched in summer of 1992) and the ongoing bull market in the likes of Mexico. So the relationship can break down but it does tend to reassert itself. It is interesting that there is this relationship between the dollar, commodities and emerging market equities. Although some important emerging markets like Brazil are significant commodity producers, most of the major Asian emerging markets are not. And over the last thirty years there has been a significant increase in EM domestic wealth which you might have expected to alter the relationship. It persists for a few reasons but they include the fact that EM countries are in aggregate much bigger consumers of commodities than they were. So one factor that influences commodity prices is demand from EM countries and the latter will be higher when they are growing strongly. Which they tend to do when their exports are robust as exports continue to be a very important driver of EM economies. 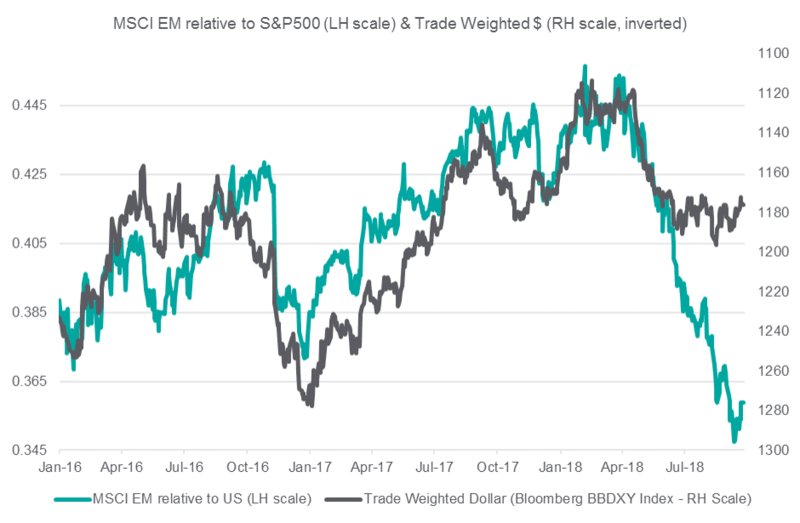 EM exports tend to do well when the dollar is weaker partly because despite the introduction of far more free floating EM currencies than there have been in the past, there is often some management of the currency with an eye on the dollar. All other things being equal, a weaker dollar does tend to make EM currencies, in aggregate, more competitive. Which helps exports which helps demand which boosts commodity prices. 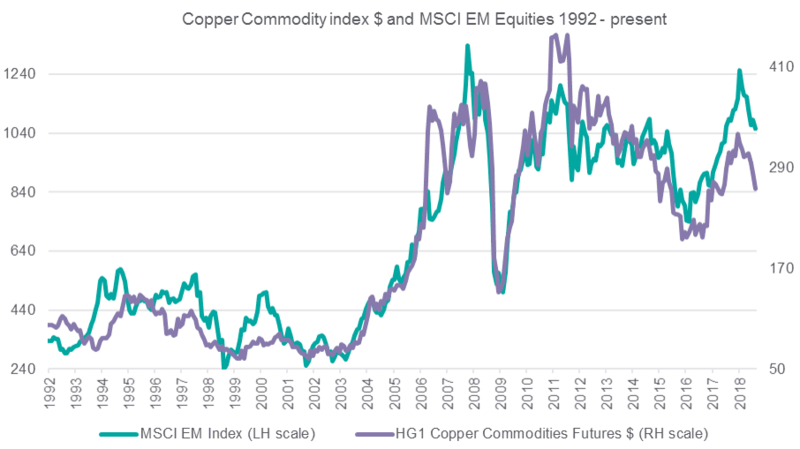 It also means that international capital flows are going to be pro commodities and pro EM when this is happening, So EM markets benefit from the confluence of weaker dollar, rising commodity prices and stronger EM exports. Therefore, unless the dollar strengthens from here, our view is that EM will do better in coming months. This will encourage global investors to look beyond the gloomy headlines around trade wars and focus instead on the opportunity to purchase companies and markets that have fallen further than many historically reliable indicators suggest is warranted. Past performance is no guarantee of future results and the value of such investments and their strategies may fall as well as rise. Capital security is not guaranteed.